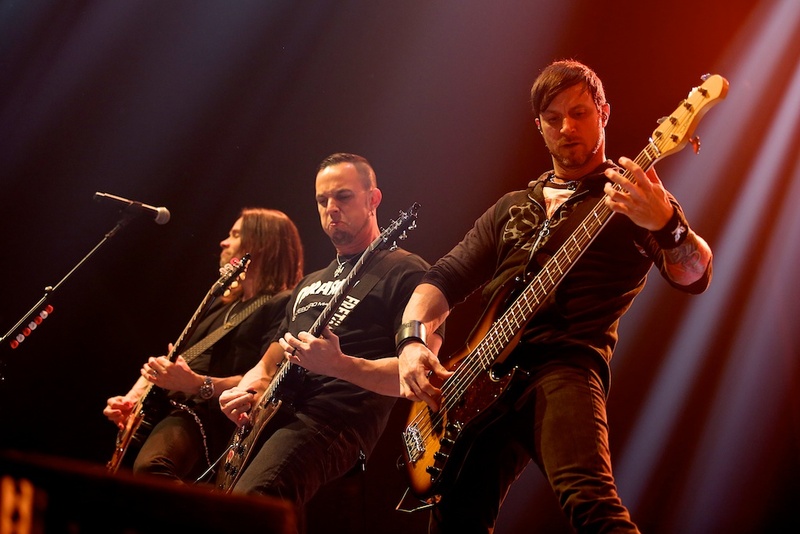 A couple of years ago rock formation Alter Bridge recorded their live dvd in Amsterdam. This time there are once again cameras in front of the stage of the Heineken Music Hall in Amsterdam. The band is headlining an almost sold out show to support the release of their brand new album Fortress. Opening act of the night is Halestorm, a young but yet promising rock act who released their second album ‘The Strange Case Of…’ earlier this year. Halestorm enters the stage almost exactly the same way as previous shows. 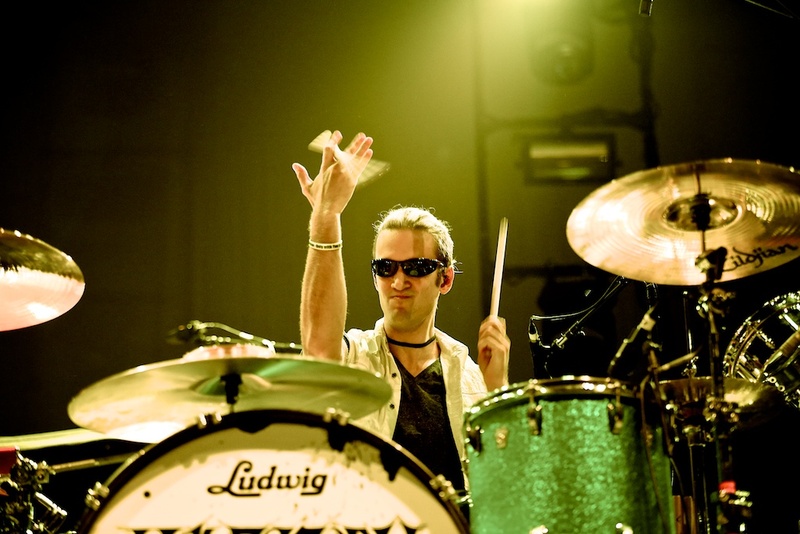 Drummer Arejay Hale walks onto the stage wearing a skull scarf and instantly tries to get the crowd excited. The biggest selling point of this act is not the drummer but his sister Lzzy on vocals and guitar. She is one hell of a front woman. Energetic, expressive and she has got one hell of a voice. However tonight Lzzy is sounding hoarse. Especially during her louder parts this becomes a bit annoying. Nonetheless the band does manage to get the crowd cheering and moving in front of the stage with some great tunes like ‘Here’s to us’, ‘Rock Show’ and ‘Love Bits (So Do I)’. A great warming up for the headlining act of the night. When Alter Bridge enters the stage you instantly feel this band is loved in the Netherlands. Loud cheering starts when shadows appear on stage. Both frontman Myles Kennedy (with Slash) as lead guitarist Mark Tremonti (his own solo project) have been busy with side projects in the past years and many people have been waiting for them to return with their main band. The band starts with the first single from their new album called ‘Addicted to Pain’ and quite a few people already know the lyrics to this one. But the entire venue starts screaming along with hits like ‘Blackbird’, ‘Ties That Bind’ and ‘Slip to the Void’. Special moments of the show are ‘Waters Rising’ where Mark Tremonti takes the role of lead vocals and ‘Watch Over You’ with Lizzy Hale from Halestorm joining Myles on stage for an intimate session. During the song ‘Metalingus’ a bra gets thrown on stage and after holding it in his hands Myles proudly puts it on top of an amplifier. Downside is the fact the sound is not perfect during the entire show and there is quite a lot resonance in the venue. This gets better during the show but you would expect better from Alter Bridge. Luckily enough Myles Kennedy is the perfect frontman and excellent vocalist and easily convinces the entire audience of his confidence. The result, a perfect rock show. Now we only have to wait what will happen with the recorded material.